James Pon, 88, still has the original documents showing the Chinese Head Tax he paid ($500) each, for his mother and himself in 1922. "Anti-Chinese agitation became a powerful force in British Columbia politics," wrote Paul Kee, a Chinese-Canadian historian, in Library and Archives Canada's "History of Canada's Early Chinese Immigrants." "Blaming Chinese immigrants when the economy turned bad became a way of organizing migrants from Great Britain and Europe around the idea of 'white supremacy,' captured best in the phrase 'White Canada Forever.'" Yee writes: "[W]hite British Columbians also firmly believed that their way of life was better than all others. They saw China as a weak nation of backward people who could never learn to live like white Canadians. Moreover, they said that Chinese people carried diseases and other bad habits (such as smoking opium) that threatened Canada's well-being." At the head of the protest was a large banner stating: "Stand for a White Canada" as the men marched to City Hall," Susan Boyd writes in Busted: An Illustrated History of Drug Prohibition in Canada. "Fears about wanting Canada to be a white nation... pushed along our first Opium Act," Boyd told HuffPost Canada in a phone interview. "The Chinese with whom I converse on the subject, assured me that almost as much opium was sold to white people as Chinese, and the habit of opium smoking was making headway, not only among white men and boys, but also among women and girls... To be indifferent to the growth of such an evil in Canada would be inconsistent with those principles of morality which ought to govern the conduct of a Christian nation." "Blaming Chinese-Canadians for the degradation of white youth through drugs, (the right-wing anti-drug crusaders) demanded harsh new drug legislation, as well as Chinese exclusion," Carstairs wrote in a 1999 article, published in the Canadian Bulletin of Medical History. Women's rights activist and jurist Emily Murphy further fanned the flames of race-related fury with articles she wrote for Maclean's magazine that were compiled in the book, The Black Candle, publishedin 1922. Murphy linked "non-white men" to drug use and corrupting the white race, and depicted cannabis addicts as murderous maniacs. 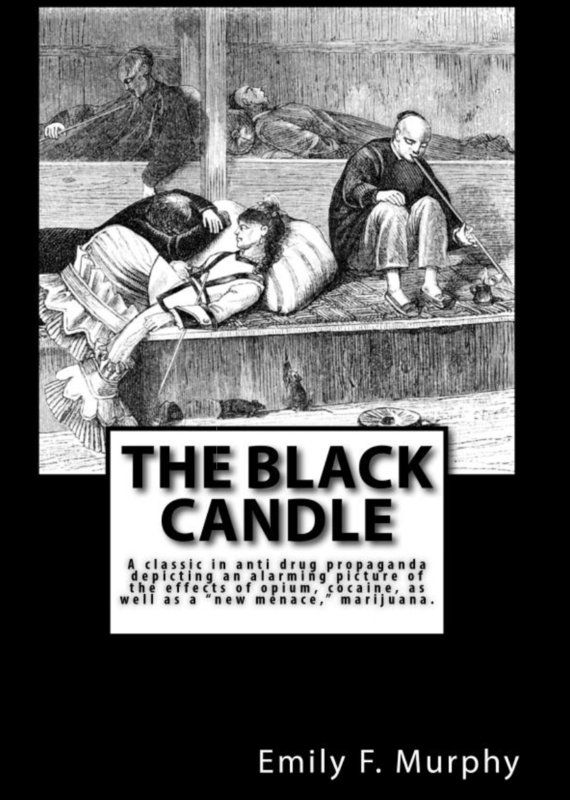 "The Black Candle propagated a distinctly anti-Chinese sentiment that reinforced a sensationalist and racialized fear of non-white drug users. Murphy's writings were situated in a moment in Canadian history that is deﬁned by white supremacy and which formed the foundation for the racialized war on drugs we continue to live with today," writes Jacqueline Kittel in an article for the University of Victoria's The Arbutus Review. Emily Murphy's "The Black Candle," fanned the flames of anti-Chinese racism. "Canada wanted to position ourselves as a moral leader on this issue. We decided to add cannabis to schedule — not because of any indication of any problem — but to be proactive and to position ourselves as a leader," Carstairs told HuffPost Canada. "The effectiveness of the drug panic depended on the creation of a racial drama of drug use that featured 'innocent' white youth and shadowy Asian traffickers who turned them into morally depraved" dope fiends," Carstairs says. Reversing drug prohibition and legalizing cannabis is a historic feat. But as Boyd points out, before we turn the chapter, drug prohibition needs to be "understood as a social justice and human rights issue. The question is how will the government address the historic violence and injustice of drug prohibition?"